The Bulls are back in town after an odd 2 win/2 loss trip to the West and South. They spent a lot of time watching the rain fall on Georgia. They are back with a 4 game lead over Norfolk and some significant changes on the roster (again). They open tonight against the Columbus Clippers, the AAA franchise of the Cleveland Indians and traditionally a formidable team in the International League West. This year they are tied for second place in their division. 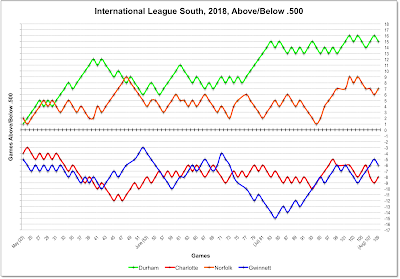 For stats geeks they show off the anomalous negative run differential with winning record. Overall, it appears that pitching is their problem. Former Bulls Brandon Guyer, Johnny Field, and Richie Shaffer have worn Clippers uniforms this year. Guyer is with the Indians. Shaffer is in the Milwaukee system. Johnny Field is playing for Rochester in the Twins system. Still with the Clippers are pitchers Jeff Beliveau, a pitcher we liked back in 2014, and Mitch Talbot, who made our list of great Durham Bulls pitchers back in 2013 and was a key player in the Bulls' first AAA championship in 2009 (trivia — he won the first and last games of that season). Looks like after joining the Cleveland system in 2010, he's done some serious roaming around including time with Korean teams and independent baseball. Of all of that list what jumps out for me is the departure of Justin Williams, whose strong right arm from right field was a wonder to watch and the call-up of Brandon Lowe for what may be a quick cup of coffee, but still a big deal for someone who had to have room made for him on the 40-man. Should Kean Wong have been the guy called up? Sure. But let's not take anything away from Mr. Lowe. And we've got a new guy in the outfield, Austin Meadows. 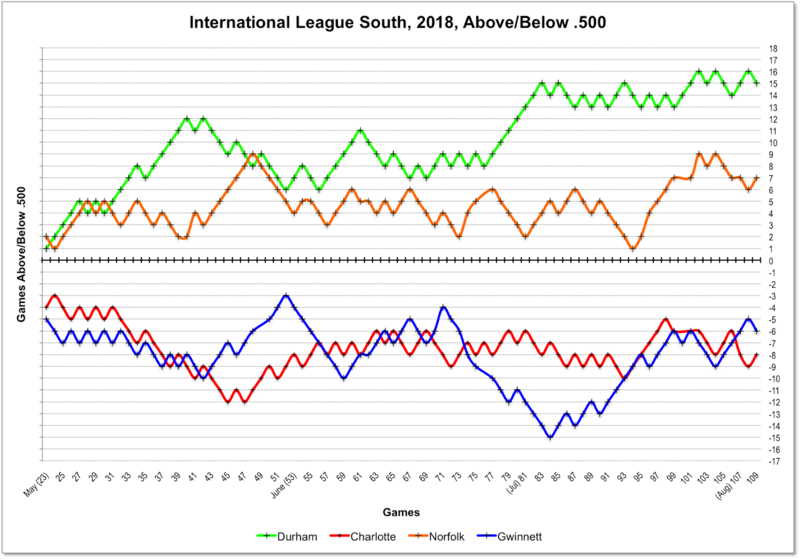 Bulls Win the South; Call-Ups Coming?